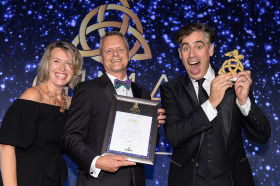 The winners of the GIMA awards 2018 were announced at the Celtic Manor Resort, Newport, in South Wales last week. The pinnacle of the garden retail industry’s calendar, the event brought together manufacturers, retailers, members of the press and industry figures, to celebrate the 17 highly-deserving winners. This year Neudorff with its VineWeevilFree - Nematodes is the proud winner of the GIMA Sword of Excellence, whilst Woodlodge won the GCA Supplier of the Year for the first time. The Gardenex Export Achievement Award has this year been awarded to Crest Garden, as a result of the company’s expansion of its Kent & Stowe range into 40 countries. Gardena, Fallen Fruits, Willow Wand, Primeur, Burgon & Ball, Deco-Pak, Smart Garden Products, Apta, Vitax andEvergreen Garden Care (previously The Scotts Miracle Gro Company) complete the winners roster in 2018. Ms Nuttall added: “A huge thank you to all our judges for volunteering their time. Their input, keen eye and industry knowledge has helped us to create a final roster of winners that best demonstrates the endless enthusiasm, innovation and inspirational content that helps make the garden retail industry such an exciting industry to be part of. About the winner: Crest Garden has expanded distribution to over 40 countries worldwide with the Kent & Stowe garden tool brand. British designed quality has appealed to customers worldwide, with resulting sales growing hugely within existing accounts. During the last 12 months, Crest has targeted Canada and the USA, where they were able to secure distribution within key distributors, multiples stores and core garden centre groups. Additional listings were secured with Mitre 10 in New Zealand, and Mountfields in the Czech Republic. Sales in Sweden via two distributors have also grown by 200% YTD against last year. About the winner: Each Willow Wand is sold as a hardwood stick cutting, making it truly innovative. The product is also displayed with a tiny sales footprint making exceptional sales per square metre possible. Extremely easy to grow, it has huge "Grow Your Own" appeal. It is a direct replacement for and has none of the problems associated with imported Mediterranean standards. About the winners: A fun and functional favourite guaranteed to fly off the shelf. Daring designs include The Garden Shed, The London Underground, The Wine Rack and 10 Downing Street. A complete gift package that appeals to a wide range of consumers and retailers. Eye-catching POS teamed with an unrivalled profit margin makes this range a retailer's dream. About the winner: By communicating to a wider audience in a playful way Evergreen Garden Care has attracted new consumers into the category, without isolating existing. The concept is more emotional, relating to human behaviour, "you wouldn't give your kids just water" so why give your plants just water! Healthy, beautiful plants need food too!